Sydney’s only fully integrated convention, exhibition and entertainment precinct is here! ICC Sydney is part of the Darling Harbour Live project – an ambitious vision to reinvigorate the vibrant Cockle Bay area on the western side of Sydney’s CBD. As a global city, Sydney already welcomes international guests with an abundance of natural beauty and a cosmopolitan lifestyle. This sophisticated development, with its arresting contemporary design, further enlivens our harbour’s shoreline with a wealth of superb new venues for functions, meetings and celebrations of all sizes. To top it all off, the prestigious Sofitel Darling Harbour is situated right next to the centre. Darling Harbour’s tallest building at 35 storeys brings 590 luxurious hotel rooms, including 35 indulgently appointed suites, to complete this glamorous picture. The elegantly appointed facilities include a rooftop infinity pool and the French-inspired Atelier restaurant and Champagne bar. Delivered through a highly successful Public-Private partnership between the New South Wales Government and a consortium comprising AEG Ogden, Lend Lease, Capella Capital, Hostplus, FirstState and Spotless, the ICC is also one of the largest LEED (Leadership in Energy and Environmental Design) -certified convention centres outside the United States, while the comprehensive Darling Harbour regeneration strategy has been awarded the Green Building Council of Australia’s 6 Star Green Star Communities certification. Innovative sustainability initiatives that have been integrated in the development include a central energy plant, massive solar array, LED lighting and high-performance glazing and insulation, achieving an overall 20% reduction in energy demand and greenhouse gas emissions. CORE appreciates the need for efficient performance solutions to support the specific design challenges of such a complex project, such as the presence of multiple classifications, as well as the shifting populations and occupant characteristics expected in hotels. 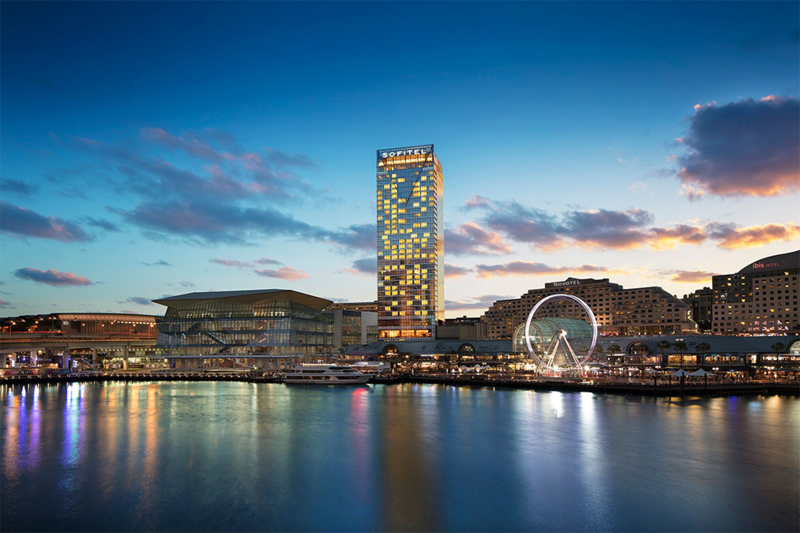 Our extensive experience with high-end hotel and hospitality projects allows us to approach exciting developments like the Sofitel Darling Harbour with confidence. We’re delighted to welcome Darling Harbour’s newest focal point. Its thoughtful and original approach to the integration of diverse functions will provide still greater flexibility in the opportunities Sydneysiders and visitors can anticipate to innovate, share, learn and celebrate.